Bits and Boxes Ultimate Memebox Giveaway Week Two! 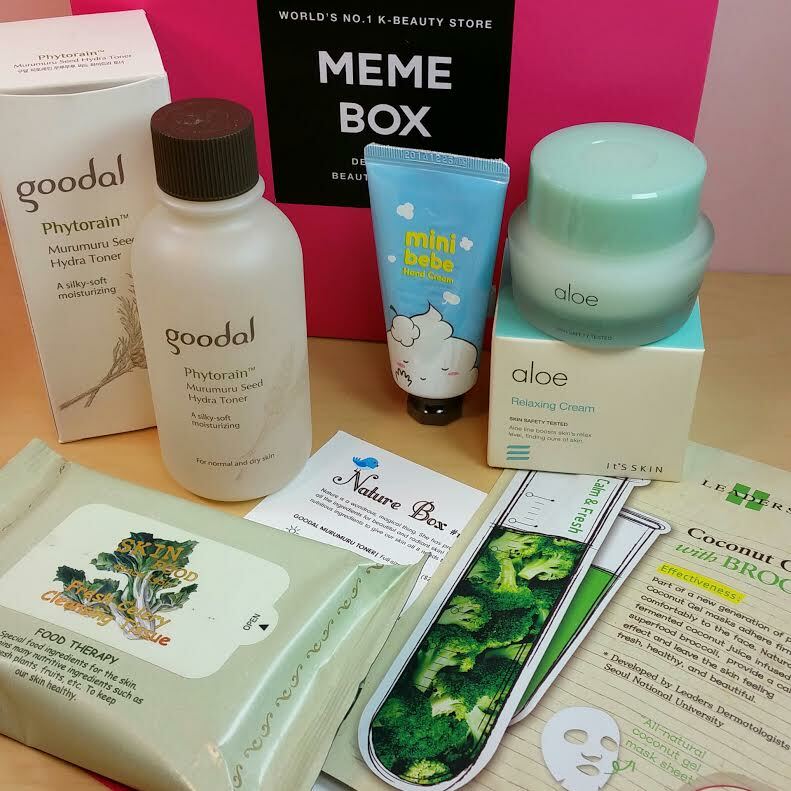 Memebox (pronounced me me box) is a great way to get new and interesting Korean skincare and beauty products. This is not a subscription box, you can buy as many as you choose and there are no recurring charges. Since the transition to a US warehouse and subsequent lack of shipping to the rest of the world, I've taken matters into my own hands. So for those of you who have been sadly lacking in Memeboxes and live outside the US (or Korea) and haven't been able to get a Memebox, here is your chance. I will be mailing the Memebox myself, no matter where in the world you live! Here's the deal! Each week this month, on Mondays, I will be putting a new Memebox giveaway up. That will be Mondays, Pacific Standard Time, for those of you in other countries. Of course it doesn't matter when during the week you put in your entries but that's when they will start. The dates left are the 13th, 20th and 27th. Congratulations to Florencia of Malaysia!! She won the first round of the Ultimate Memebox Giveaway and her Memebox #beginwithskin will be on it's way to her shortly! This week, you have a chance to win a Memebox Nature for Your Skin! This is actually one of my favorites of the available Memeboxes. I love the brands and think this is a pretty well rounded box, both for beginners and for those who have been dabbling in kbeauty for awhile. Goodal Phytorain Murumuru Seed Hydra Toner-Made from the seed butter of the ‘Murumuru palm tree’, this toner helps brighten and clear the skin, and keeps water and oil in balance. This toner is also formulated with cupuacu butter and brazil nut seed oil, which are quickly absorbed by the skin and provide deep moisture. It's Skin Mini BeBe Hand Cream Vanilla Cotton-Formulated with natural and moisturizing ingredients deliver instantaneous hydration to chapped, rough, and dry hands! Replenish moisture to your hands without that sticky feeling some hand creams leave your skin, and enjoy smooth, soft, moisturized hands with a pleasing hint of a vanilla cotton aroma. It's Skin Aloe Relaxing Cream- Made of aloe, watermelon, avocado, and cucumber extract. The aloe vera plant has long been known for its healing and soothing properties. Aloe contains over 75 different nutrients which work to moisturizes, heal and restore the skin. Skinfood Fresh Celery Cleansing Tissue-A cleansing tissue featuring celery extract that removes make-up residue and impurities to provide fresh, clean and refreshed skin without a sticky after feel. Leaders Coconut Gel Mask With Broccoli-This skin transforming mask made of natural coconut jelly bio-cellulose material and perfectly adheres and fits comfortably on your skin to deliver calming and soothing properties for troubled skin. Formulated with broccoli extract which contains an abundant amount of Vitamin C and Beta-Carotene to protect the skin from environmental irritants, and helps to maintain a clean and fresh complexion. Total Value of this Memebox is $63. This giveaway will begin Monday, April 13th and end Tuesday, April 21st at 11:59pm PST. While this giveaway is over, make sure to enter the Week 3 giveaway for a Memebox x Pony box! If you would like to know more about Memebox and the products they have (and you live in the US), you can check their website out here. They have some great brands like Clio, Goodal, Skinfood and Missha along with their own house brand as well. They've been collaborating with some well-known Korean models and Youtubers (and our own Soothing Sista) to produce some great makeup items. My personal favorites are the lipsticks, Mememasks and the SoothingSista palette. You can see all the boxes they have available currently right here. If you decide to make a purchase of any kind, make sure you check out my Memebox Deals page to find a coupon to use! You also still have a chance to enter the Week 1 giveaway for a Memebox #beginwithskin Korean Beauty Starter Kit. That giveaway ends Tuesday, April 14th at 11:59pm PST. Love the chance to win something from Memebox - as mad as I am that they stopped shipping to Canada, I still miss them! I know just how you feel. It's not the same Memebox, though, so even here in the US, I still miss the old Memebox. /cry Good luck! Excellent Giveaway , done all the steps , Wish to win . I am living in India.